It's time to break down the barriers to greater productivity, take a giant leap toward improved communications, and embrace one of today's most intelligent, versatile, and cost-effective telecommunications solutions. 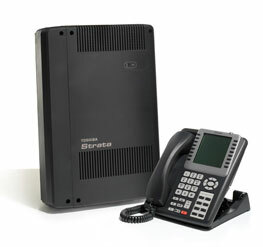 The Strata CIX40 is the business telephone system that lets you work exactly as you need to today, while giving you the ability to cost-effectively add capabilities as you grow. Modular in architecture. Scalable in design. Networkable with other systems. The Strata CIX40 lets you combine CO lines, telephones, and peripherals in any configuration - and the ability to build out your system as you grow. Expand up to 26 ports and 11 CO Lines - and even more by networking multiple systems. Strata CIX40 provides the configuration flexibility you want to build the communications system you need now, and expand as your needs grow. Supports a complete line of Toshiba digital and IP telephones, analog telephones, as well as analog and digital Public Switched Telephone Network (PSTN) interfaces, and StrataNet multi-system networking interfaces. You can configure your communication system to include any combination of these devices and know that they'll work together seamlessly. Start small and grow as you need, with the modular architecture of the Strata CIX that enables you to add capacity and new capabilities. Whether you're ready for IP telephony today or sometime down the road, your options allow you to decide when and where it makes sense for you to deploy IP telephony or legacy equipment migrated from other systems. Using Toshiba's FeatureFlexTM adaptability tool, the Strata CIX, with the integrated Media Application Server, enables you to tailor your system well beyond standard system and administrative options and basic programmable features. Modify existing features - and create new ones. And not just CIX call processing, but blended features that work between all system applications and resources. This includes voice mail, CTI applications, and more.